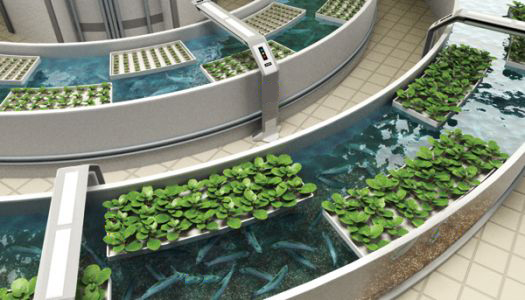 Aquaponics is a combination of Aquaculture & Hydroponics. Water from a fish tank circulates through a grow bed delivering nutrients to plants grown there. Nitrifying bacteria convert fish wastes into plant-available nutrients. The water in the fish-tank is filtered by the plants, giving the fish clean water to live in. The process of Aquaponics is a natural interaction between plants and fish that neutralizes pollutants. Both the plants and the fish contribute to the cycling process in a symbiotic relationship – the fish provide the nutrients for the plants and the plants filter the water so that the fish are able to live. 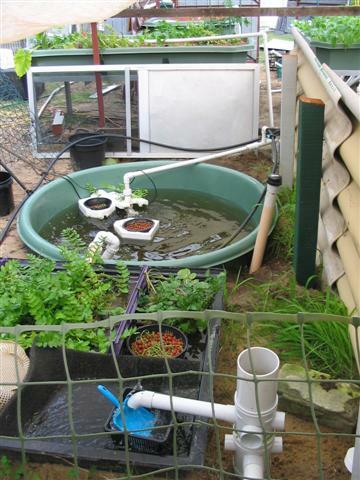 Natural chemicals and the fish food are the only additives to the Aquaponics system. 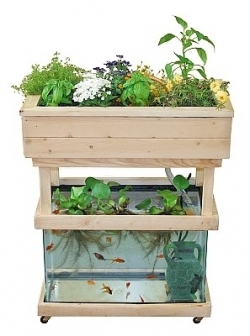 Aquaponics systems vary in size from an indoor fish tank with either fish you can eat or look at that can be adapted to an aquarium that is already operating, or commercial systems for market distribution. Some of the benefits of this system include: Reduced chemical and water usage. Aquaponics does not use any chemical fertilisers or artificial nutrients. 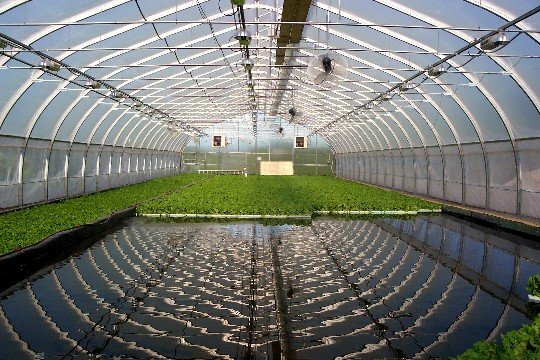 In an indoor system such as a greenhouse it eliminates the use of pesticides. Erosion is also reduced by eliminating the need to plow soil and eliminate weeding for the home gardener. The system’s adaptability and minimal running costs compared to a conventional horticultural set-up, make this system affordable to everyone. chemicals are typically dumped. Compared to conventional systems, Aquaponics does not collect contaminants in the system that cause water to become toxic due to the build up of nitrites. The plants consume this waste as their main nutrient source. The bacteria in the grow beds converts the nitrites into nitrates. Essential to the Aquaponics system, the beneficial bacteria are intrinsic to its grow-rate, without which the water would quickly become toxic to the fish, and plant nutrients would not be produced for the plants, while the fish would choke in their own wastes. By converting ammonia into nitrites and then into nitrates, the bacteria convert fish waste into plant-available nutrients, , which becomes the main growing agent for the plants. The bacteria are aerobic, and proliferate in oxygen rich conditions. The system has turned anaerobic when there is not enough oxygen, and smells will develop. Bacteria builds up naturally when a system is setup. Testing of your Aquaponics water is essential to know how your system is performing, keeping records gives a good indication of how balanced the system is. All fish require dissolved oxygen to survive. the amount of oxygen that the water can hold depends on the properties of the water, particularly temperature, with warmer water holding less oxygen. High oxygen depletion occurs shortly after feeding. Factors that will change the amount of dissolved oxygen in the system include the amount of fish that results in less oxygen, higher temperature will also result in oxygen reduction, as will high concentrations of dissolved salts and use of air diffusers. Water will only absorb a certain amount of oxygen before it becomes saturated. Water temperature is critical for fish survival. A drop or rise in temperature too great can induce a state of shock, possibly causing fish deaths. Each species of fish has a different temperature range, and depending on your climate, heating or cooling of the water may be needed to maintain a suitable living environment. In cold locations, if water is not heated over winter the fish will enter a type of suspended animation, where they will not eat or swim too much, until water warms up again. The pH is a way of expressing the number of Hydrogen ions in water. Pure or distilled water has a pH of 7 which is classed as neutral. The pH scale ranges from 0 -14, anything below 7 is acidic, anything above 7 is alkaline. The optimum range pH is between 7 – 7.5, which is a compromise between optimal ranges for the fish, plants and bacteria. Large differences occur between the hardness of rainwater that is slightly acidic and bore water which is more acidic, due to bore water traveling through the ground and dissolving compounds such as carbonates. The more dissolved material in the water, the harder the water is. Soft water has 0 – 55ppm, very hard water has 211 – 500 ppm. The hardness is used to show the total concentration of calcium and magnesium ions in the water, and is measured in parts per million (ppm) of calcium carbonate. Both macro nutrients and micro nutrients are essential for the plants in an Aquaponics system. Most of these come from the fish waste, which has been produced from the ingredients of the fish food. These nutrients improve flavor in fruit and vegetables and aid plants in the recovery of pest and disease problems.